Once upon a time Surya, the Sun God, misbehaved with his charioteer, Arun, a devotee of Shiva. Angry with Surya for doing so, Shiva cursed him to lose his brightness leading to his golden skin turning black. A remorseful Surya did penance for a long time at this temple, but Shiva remained unmoved. One night, Surya screamed out in anguish disturbing the Goddess Parvati (Lalithambigai). She was roused to anger and would have cursed Surya to oblivion if Shiva hadn’t intervened in time and calmed Her down. Eventually, Shiva also forgave Surya and restored his brightness and golden skin. According to one of the priests I met at the Lalithambigai Temple, as well as the several accounts I came across on the internet, the sculpture being discussed in this post depicts Shiva calming Parvati when she was angry with Surya and wanted to curse him. 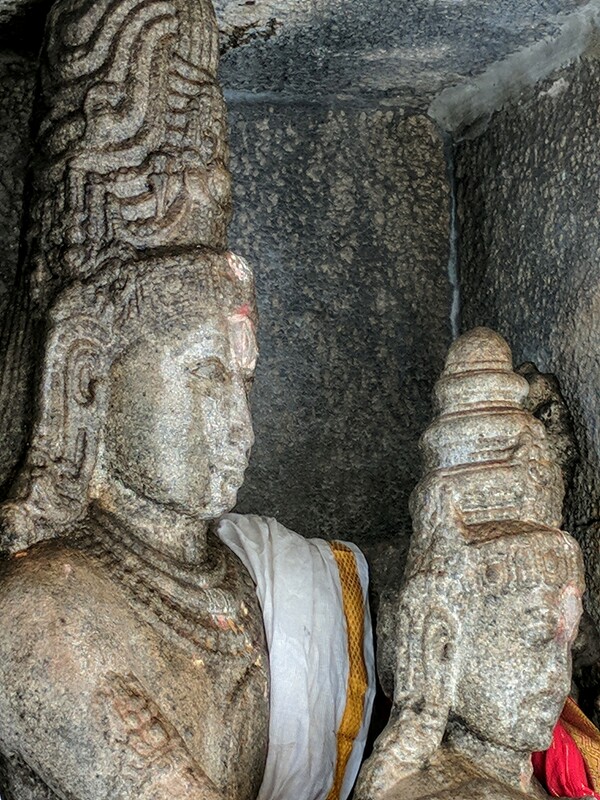 The Shiva and Parvati sculpture in a niche at the Lalithambigai Temple. The lettering above the niche is in Tamil and reads “Kshetra Puraaneswarar”. 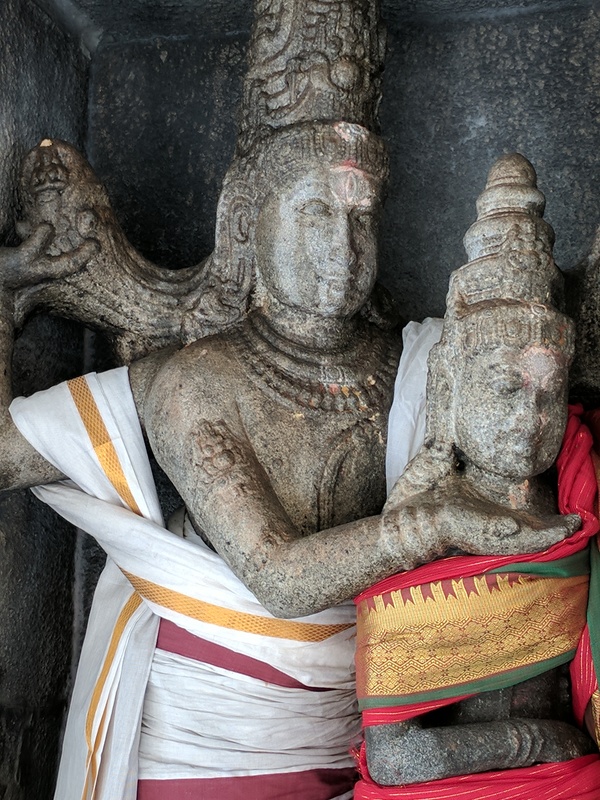 While I agree Shiva is definitely calming Parvati, I don’t think it has anything with the sthala puranam of the Lalithambigai Temple and instead represents another form of Shiva as Gangadhara and therefore another story. Before I narrate that story let me draw your attention to three things in the sculpture — (i) Shiva extending a lock of his hair with one of his right hands, (ii) Ganga in Shiva’s locks being held up in his hand (see photo below), and (iii) Parvati and her body language. According to legend, King Bhagiratha wanted to bring Ganga, who was a celestial river, to earth so that the souls of his ancestors could be liberated. After a long penance, Ganga agreed, but warned that the force of her descent from heaven could well destroy the earth. Bhagiratha then prayed to Lord Shiva who stepped in help — first by breaking the force of the Ganga’s descent from heaven by capturing her in His hair, and second, by reducing it to a manageable and non-destructive flow and only then allowing Ganga to touch the earth. Because Shiva, captured Ganga in his locks and holds her there, He got the name Gangadhara. At one level, this sculpture is the depiction of that story. But this story is not just about Shiva and Ganga; there is another part to the story that involves Shiva’s wife, the Parvati. She was none to happy or pleased to have Ganga in Her husband’s hair. Literally. And that is why most depictions of the Gangadhara form of Shiva will show an annoyed or petulant Parvati with a body language that conveys Her strong disapproval of the whole ‘arrangement’ of Shiva and Ganga. At the Gangadhara panel at Elephanta Caves, Parvati’s body is curved away from Shiva, even as He reaches out to touch her shoulder reassuringly. 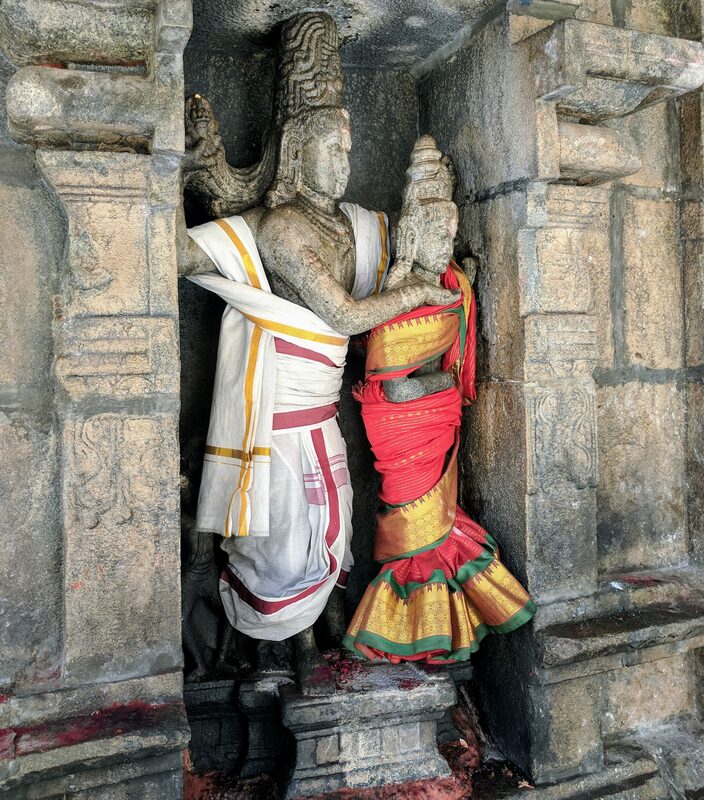 Similarly, the Gangadhara panel at the Kailasanathar Temple in Kanchipuram, too, has Parvati curved away from Shiva and looks away, bored and disinterested. Here, too, Shiva’s hands reach out to touch her shoulder, reassuringly. Let us look at our sculpture again and examine the details. Based on the iconography, I feel and have no doubt in declaring this to be a Gangadhara panel. 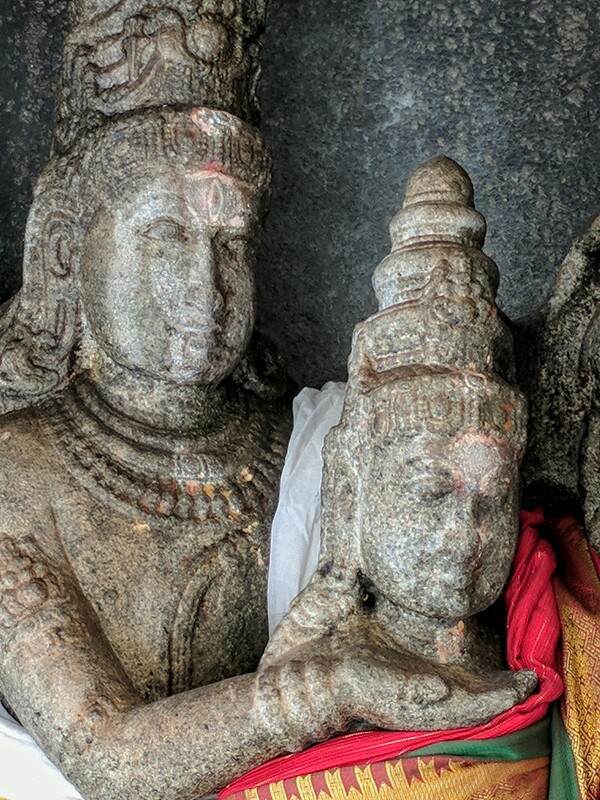 Shiva and Parvati or Gangadhara? Shiva tries to appease Parvati. One of his hands reaches out to cup her chin, but Parvati’s rigid stance and the way her right hand is tucked firmly against her body indicates her displeasure. Even as Shiva reaches out to Parvati, one can’t help noticing the downcast expression on Her face. When I saw the illustrations and read this description in the book, I was elated. 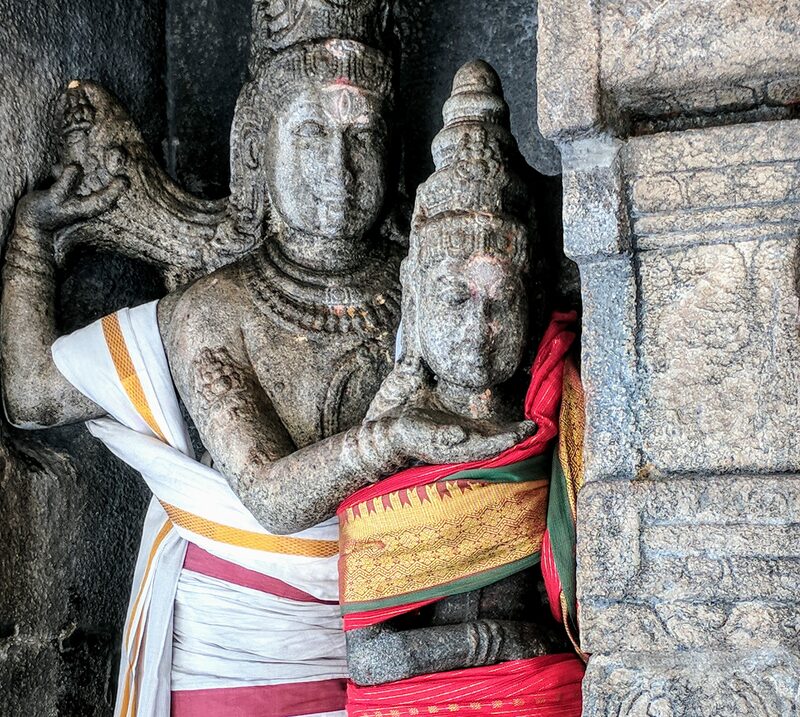 I also had a re-look of the photographs, particularly the small figure behind Shiva — partially hidden here because of Shiva’s panchakachham or dhoti. Initially, when I saw this figure, I had assumed it was the sage Bhringi, a great devotee of Shiva. But in the light of the above lines, and also that Bhringi is usually depicted between Shiva and Parvati, I wondered if it could not be Bhagiratha himself, waiting for Ganga to be released from Shiva’s locks. Who is the figure behind Shiva? Bhagiratha? I saw this sculpture when I visited the Lalithambigai Temple last August. It was the culmination of a desire to see the sculpture ever since Radha a.k.a. Hip Asian Traveller sent me a photo of it. I had seen nothing like it before and was mesmerised. Since the sculpture was clothed, I couldn’t see the details and though I could guess at its identity, I had to wait till I actually saw it for myself. If the photograph had me mesmerised, I was smitten when I saw the granite sculpture. The form, the lines, the bhava, Shiva’s elaborate jatamukuta, Shiva trying to make up with his wife, a sulking Parvati and her rigid body language, and Bhagiratha (?) waiting for the descent of Ganga — a stone sculpture reveals so much. I could have stayed there for a long time just gazing at the sculpture, but reality intervened in the form of a priest asking me to leave as it was time for the temple to close. But now, all that is past and as I write the closing lines to this post, I feel a sense of amazement at various levels — at how a sculpture has lent itself to so beautifully and so convincingly to three, or rather two, narratives — one a local legend and the other a larger, pan-Indian story. Amazement also at how a local narrative has been neatly fitted into an artistic depiction that is anything, but local. And most of all amazement at the beauty and versatility of a stone sculpture conveying such myriad emotions and narratives. Tell me, what do you think the sculpture represents? Thirumeeyachur Lalithambigai Temple by N. Saikrishnan. This blog post has the detailed sthala puranam and also talks about the other legends associated with the temple. Thank you very much, Paghnabee. I’m so happy that you liked reading this post. Excellent blog. Looking forward to more. Interesting story. The expressions on the sculpture are so beautiful. It is the expression that drew me to this sculpture in the first place. Seeing it on a photo was one thing, but seeing the nuances for real at the Lalithanbika Temple was another thing altogether. Beautiful write up. A carving of Mahadev cajoling Parvati maa is in my post of today. Seeing this post brought a smile on my face.